Internet Explorer security zones play an important role in ensuring the security of Windows Vista systems. You can use security zones to restrict or permit access to specific types of Web content, including ActiveX controls and plug-ins, file and font downloads, Java applets, and scripts. You can also use security zones to control the types of actions users can perform while viewing Web content. For example, you can enable launching of programs within an internal browser frame, known as an IFRAME, but disable installation of desktop items. Group Policy can be used to manage security zones in several ways. You can set policies that control the user actions with regard to security zones and customize the settings for each security zone. Before exploring how these procedures are implemented, let's look at what security zones are and how they are used. Security zones are used to control Web content permissions for various content servers based on where they are located and what is known about them. Each security zone is assigned a default security level, which ranges from low to high. Low security means that most actions are permitted and the security restrictions are very relaxed. High security means that most actions are disabled and the security restrictions are very stringent. Restricted Sites Controls user access to Web content on sites that could potentially damage a computer or its data. Default security level is High. Security With Windows Vista, the Binary And Script Behaviors security setting is disabled by default in the Restricted Sites zone. This important security change is designed to prevent the execution of scripts and other components that encapsulate functionality for HTML elements. In other zones, Binary And Script Behaviors is enabled by default, which could allow the execution of malicious scripts. Trusted Sites Controls user access to Web content on sites that are explicitly trusted and are considered to be free of content that could damage or harm the computer and its data. Default security level is a slightly modified version of Low, which allows downloading of unsigned ActiveX controls and sets Java permissions to Medium security. Local Intranet Controls user access to Web content on the local network, which can include local (intranet) sites, sites bypassed by the proxy server, and all network paths, such as Universal Naming Conventions (UNCs). Default security level is Medium-Low. Internet Controls users' access to Web content on all sites not placed in other zones. Default security level is Medium-High. Obvious security risks result from the enabling of ActiveX controls, plug-ins, Java applets, scripts, and downloads. A not-so-obvious risk results from the Logon parameter, which determines whether user name and password information is sent automatically to content servers when a logon is needed. Of all the available parameters, Logon is the one that most people overlook. The key risk from the Logon parameter is that computers outside the network can gain access to logon names for your network and unauthorized external users could use the logon names to stage attacks on your system. With High security, content servers prompt for a user name and password when a logon is needed, and information is never passed automatically. With Medium-High, Medium, or Medium-Low security, the current user name and password are automatically returned for logon requests to resources in the Intranet zone. Unlike earlier versions of Windows, Windows Vista uses automatic intranet network detection by default so the current user name and password are only returned for resources on the intranet network. If Windows Vista is unable to detect the intranet network automatically, you may need to manually configure the intranet zone settings. In this case, intranet sites, network paths (UNCs), and sites bypassed by the proxy server could all be considered as being in the intranet zone. And it is the bypassed sites that are easy to forget when you're considering possible security issues. With Low security, logon information is returned for logon requests from content servers in any zone. This is a dangerous setting when used with external content servers. Security Zones: Use Only Machine Settings Enabling this policy sets security zone settings by machine rather than by user. The policy is intended to ensure that security zones are consistently applied to all users of a computer. Unfortunately, if you enable this policy without also preventing users from changing security zones, any user could make changes to security zones that affect all other users of the computer. This policy is located under Computer Configuration\Administrative Templates\Windows Components\Internet Explorer. Security Zones: Do Not Allow Users To Change Policies Enabling this policy prevents users from changing security zone settings. If you enable this policy, the Custom Level and Default Level buttons are disabled on the Security tab of the Internet Properties dialog box. This prevents users from changing the security zone settings established by the administrator. This policy is located under Computer Configuration\Administrative Templates\Windows Components\Internet Explorer. Security Zones: Do Not Allow Users To Add/Delete Sites Enabling this policy disables the Sites button on the Security tab of the Internet Properties dialog box. This prevents users from modifying the site management settings for the Local Intranet, Trusted Sites, and Restricted Sites zones, which means users cannot add sites, remove sites, or change the Include settings for the Local Intranet zone. This policy is located under Computer Configuration\Administrative Templates\Windows Components\Internet Explorer. Disable The Security Page Enabling this policy removes the Security tab in the Internet Properties dialog box. This prevents users from making any changes to security zones. This policy takes precedence and overrides Security Zones: Do Not Allow Users To Change Policies and Security Zones: Do Not Allow Users To Add/Delete Sites. This policy is located under User Configuration\Administrative Templates\Windows Components\Internet Explorer\Internet Control Panel. Enable one or more of these policies to enforce restrictions on changing security zone settings. Double-click the policy, select Enabled, and then click OK.
Windows Vista includes policies for locking down the local machine security zone. This special security zone applies only to the security of the local computer and is designed to prevent users from making changes that could materially affect the security of their computers. Any policies set under User Configuration\Administrative Templates\Windows Components\Internet Explorer\Internet Control Panel\Security Page\Locked-Down Local Machine Zone are locked out in the local machine zone and set according to their policy configuration. Rather than setting each policy individually, you can use the Locked-Down Local Machine Zone Template policy under User Configuration\Administrative Templates\Windows Components\Internet Explorer\Internet Control Panel\Security Page to set the local machine zone security so that it is consistent with a specific security level. Configure each of the four security zones as discussed in this chapter. When you are finished, access User Configuration\Windows Settings\Internet Explorer Maintenance\Security in Group Policy and then double-click Security Zones And Content Ratings. Select Import The Current Security Zone Settings And Privacy Settings and then click Modify Settings. You can now check the security zone settings you defined previously. When you are finished, click OK twice to apply the policy. Access the Internet Properties dialog box and then select the Security tab. To restore the default level if it was changed, click Default Level. Then click OK and skip the remaining steps. To set a different or custom level, click Custom Level. You can use the Security Settings dialog box to set a custom level for individual parameters or reset the zone to a preset security level. If you want to use a custom level, use the buttons provided to set individual parameters and then click OK. If you want to reset the zone to a particular security level, select the level using the Reset To drop-down list, click Reset, and then click OK. The standard security levels that can be used for this zone are Medium, Medium-High, and High. In the Internet Properties dialog box, click the Security tab and then click Local Intranet in the zone list. Next define which sites are included in the Local Intranet zone by clicking Sites. This displays the Local Intranet dialog box, shown in Figure 1. Figure 1: If automatic detection doesn't work, optimize the Local Intranet settings for your environment by including or excluding various options. By default, Internet Explorer attempts to automatically detect whether the user is on the intranet network and if so, sets address checking appropriately. If Windows Vista is unable to detect the intranet network automatically, you may need to manually configure the intranet zone settings. 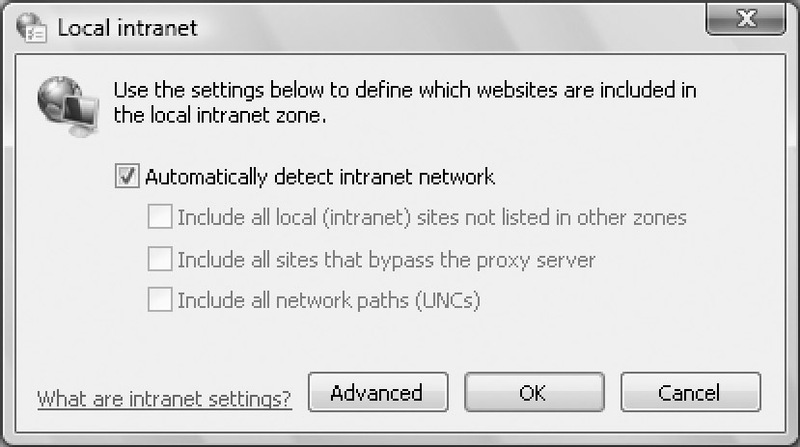 To do this, clear Automatically Detect Intranet Network and then include or exclude local (intranet) sites not listed in other zones, sites that bypass the proxy server, and network paths (UNCs). To include a resource, select the related check box. To exclude a resource, clear the related check box. q Add a site by typing its IP address in the Add This Web Site To The Zone text box and then clicking Add. q Remove previously defined sites by selecting the site in the Web Sites list box and then clicking Remove. q Require secure verification using HTTPS by selecting Require Server Verification (HTTPS:) For All Sites In This Zone. Click OK twice to close the Local Intranet dialog boxes. In the Internet Properties dialog box, click the Security tab and then click Trusted Sites in the zone list. Click Sites to define which sites are included in the Trusted Sites zone. This displays the Trusted Sites dialog box. You can now add and remove trusted sites from this zone. All Web sites in this zone will use the zone's security settings. To add a site, type its IP address in the Add This Web Site To The Zone text box and then click Add. To remove a site, select the site in the Web Sites list box and then click Remove. You can also require secure verification using HTTPS. Select Require Server Verification (HTTPS:) For All Sites In This Zone to enable this feature, or clear the related check box to disable this feature. In the Internet Properties dialog box, click the Security tab and then click Restricted Sites in the zone list. Click Sites to define which sites are included in the Restricted Sites zone. This displays the Restricted Sites dialog box. To add a restricted site, type its IP address in the Add This Web Site To The Zone text box and then click Add. To remove a site, select the site in the Web Sites list box and then click Remove. Click OK twice to close the Restricted Sites and Internet Properties dialog boxes. Site restrictions don't prevent users from accessing unauthorized sites; they merely establish a different security level for these sites. To prevent users from accessing restricted sites, you need to configure a proxy server or firewall.